Adama Barrow, the man who won The Gambia’s disputed election, has been sworn in as president. He took the oath at the country’s embassy in Senegal, ordering Gambian soldiers to remain in their barracks. West African leaders have threatened to remove him by force. The UN Security Council backed their efforts to ensure Mr Barrow assumed power. But the 15-member council stressed on Thursday that this should be pursued “by political means first”. Mr Jammeh lost the 1 December poll, according to the Gambian electoral commission. But he wants the results annulled, citing errors in the electoral process. In his inauguration speech, he ordered all members of The Gambia’s armed forces to remain in their barracks. “Those found illegally holding arms will be considered rebels,” he warned. Nigeria said on Thursday that its “armed reconnaissance air force are over Gambia”, AFP reports. Meanwhile, Mr Jammeh’s term in office has been extended for three months by a two-thirds majority in parliament. Some experts say he still has a legitimate claim to be called the country’s president. It is eerily quiet in The Gambia’s capital. Most streets are deserted; shops, petrol stations and banks are all closed. People are mostly staying home, uncertain about what may happen, as European tourists continue to evacuate their hotels. In some areas, men are standing on the roadside, arms crossed or looking at their phones. Some told us they were waiting for President Jammeh to go and would take to the streets once Mr Barrow was sworn in this afternoon. They said they wanted West African troops to come in as soon as possible. Some also told us they were worried about Mr Jammeh’s actions should there be an offensive against him. But so far we have seen little presence of security forces in the city. Hopefully not. The Gambia’s army chief, previously seen as a close ally of Mr Jammeh, seems wary of action. “This is a political dispute. I am not going to involve my soldiers in a stupid fight. I love my men,” AFP quotes Ousman Badjie as saying. However, he has little influence over an elite unit of fighters, called the Gambia National Guard, who may opt to fight even if vastly outnumbered by the Senegalese and Nigerian forces. as they are from the same ethnic group as Mr Jammeh. 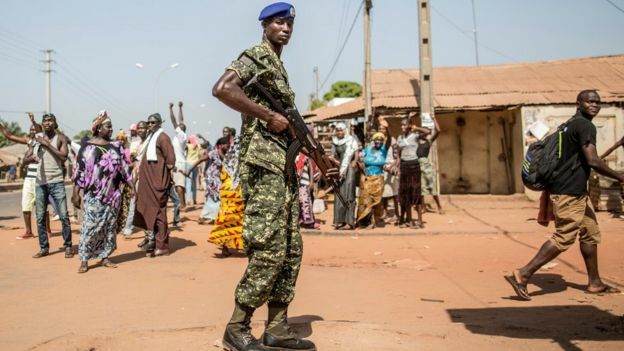 The Gambia’s armed forces are said to number 2,500. One key question is how ordinary Gambians see the Senegalese troops if they do cross the border. The Gambia and Senegal are made up of the same ethnic groups, divided by colonial borders, so they speak the same languages and share the same culture. However, a fierce rivalry has developed between the two nations, with many Gambians feeling they are looked down on by their more numerous, French-speaking neighbours. So while supporters of Mr Barrow will presumably see any intervention favourably, there is also a danger that it could be seen as a foreign invasion force. Why is Mr Barrow in Senegal? Mr Barrow, a property developer who has never held public office, has been in Senegal since the weekend following an invitation to attend a summit of African leaders who back his victory. He did not even go back home when his eight-year-old son died after being mauled by a dog. He missed the funeral on Monday as he was advised to remain in Senegal for his safety. He has joined at least 26,000 Gambians who have sought refuge in Senegal. His spokesman says Mr Barrow’s team is keen for a peaceful resolution, but accepts military intervention may be inevitable. Why is Mr Jammeh refusing to stand down? Mr Jammeh, who first came to power in a bloodless coup 22 years ago, initially accepted defeat, but later reversed his position. The electoral commission has accepted that some of the results it initially published contained errors, but said they would not have affected Mr Barrow’s win. Mr Jammeh’s legal challenge to have the vote annulled cannot be heard by the Supreme Court until May because of a lack of judges, so parliament has stepped in and extended his term in office by 90 days and imposed a three-month state of emergency. Human rights groups accuse Mr Jammeh of repression – a claim he denies. Adama Barrow sworn in as Gambian President, Yahya Jammeh refuses to quit 0 out of 5 based on 0 ratings. 0 user reviews.